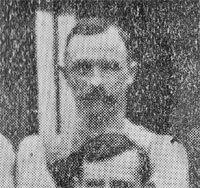 Debuting in 1899 McNamara played 69 games and kicked 8 goals. He was born in Belfast (Port Fairy), and recruited to Carlton from Brunswick. "Surrounded by his 11 grandchildren and 10 great grandchildren, Mr. Bill McNamara celebrated his 80th. birthday at the Reservoir home of his son, Patrick, last night. Mr. McNamara, who was captain of the Carlton team in 1902, was not one to whit disappointment over Carlton's one point defeat on Saturday. 'The better side won on the day,' he said, but he still thinks Carlton a grand team and never misses one of their matches. 'Still, today's boys don't play the game as hard as we did.' 'It's a bit like the game of tigggy now. They're inclind to tig rather than dump their opponent,' he chuckled. V.F.L. Umpire 1906-1910 officiated in 104 VFL games, mostly as a boundary umpire. Bill was running the boundary in the Carlton - Collingwood 1910 Grand Final. McNamara passed away on the 21st November, 1959 aged 83. Contributors to this page: blueycarlton , WillowBlue , molsey , Bombasheldon , tmd1 , Jarusa , nikki and admin . Page last modified on Sunday 23 of December, 2012 15:49:44 AEDT by blueycarlton. 1987 Rd 5 - Stephen Kernahan fends off T.Daniher. 1972 Rd 18 - Nicholls palms the ball to Gallagher.